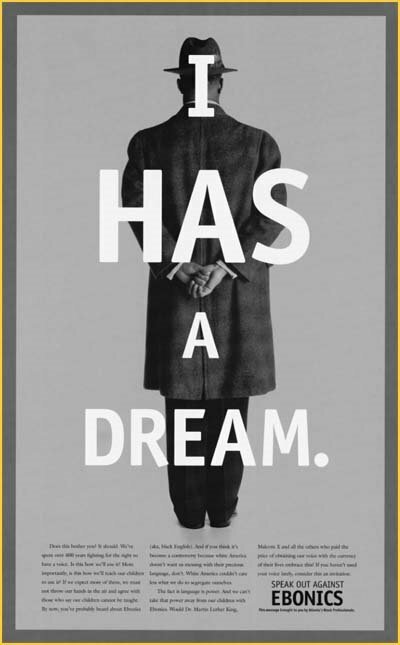 Language and Culture: "I Has a Dream..."
"Does this bother you? It should. We've spent over 400 years fighting for the right to have a voice. Is this how we'll use it? More importantly, is this how we'll teach our children to use it? If we expect more of them, we must not throw our hands in the air and agree with those who say our children cannot be taught. By now, you've probably heard about Ebonics (aka black [sic] English). And if you think it's become a controversy because white America doesn't want us messing with their precious language, don't. White America couldn't care less what we do to segregate ourselves. The fact is language is power. And we can't take that power away from our children with Ebonics. Would Dr. Martin Luther King, Malcolm X, and all the others who paid the price of obtaining our voice with the currency of their lives embrace this? If you haven't used your voice lately, consider this an invitation." "The fact is language is power. And we can't take that power away from our children with Ebonics." Ok.. that reads wrong. Not quite sure if that was for impact or not. Given the context of the ad. Or if I'm just tired. Astute reading of their error. Such an error is ironic and funny given the goal of the ad and its gross misrepresentation of Black English. It reminds me of a time when my mother backed into a fire hydrant while complaining that Asian people cannot drive. I've been all over Asia and they can't drive. Women can't drive, either. You should get more experience before you put down your own mother in public. A failure or perceived failure of a relative reflects badly on yourself. I don't remember what Ebonics was or is, but African American Vernacular Dialect is a hinderance to Black people and should be eliminated. It's farther from Standard American Written English than most American White Dialects are. Italians immigrants should learn an American dialect sufficiently close to Standard; Africans have been treated as immigrant-citizens since Lincoln and should do likewise. Or let them keep their dialects at home, but they should be educated sufficiently that they can speak and write in a more Standard dialect. Unfortunately, most people are so ignorant about Linguistics that they don't have anything intelligent to say about this. The American Government has secretly engineered the current rap-fueled ruin of USA-citizen former-slave West Africans. If the government led Blacks better, life would be much better for them. We have a wicked people and a wicked government. The above comment wins high marks for terribleness. @Ryan - while technically true, context is everything. Ebonics: How detrimental is it?